The easternmost Caribbean island sits on the edge of the Atlantic Ocean. The balmy, tropical climate is cooled by the continual trade winds blowing in from the east. The fresh breezes, warm sunshine, and sufficient rainfall make the year-round average daytime highs of 75-80 degrees Fahrenheit (24-29 degrees Celsius) very comfortable. Barbados weather is mostly sunny and fair with warm days, cool winds and cozy nights. Barbados is in the tropics, and believe it or not, some people actually put on a sweater in the cool night winter time breezes. Barbadians complain that the sea is cold when its 78deg-F !!! Still, the weather in Barbados is sunnier and drier than that of many other islands in the Caribbean. On the southern edge of the Atlantic hurricane belt, Barbados is not as arid as Aruba and has a slightly higher chance of hurricane contact, but it is far from the dense forests of Puerto Rico or the misty jungles of the Dominican Republic. The dry season spans from December to June, and during the so-called wet season (July to November) some brief rain showers are likely. Most showers in the Caribbean are quick, and simply act to wash the dust away and cool things off a little before the sun comes back out. 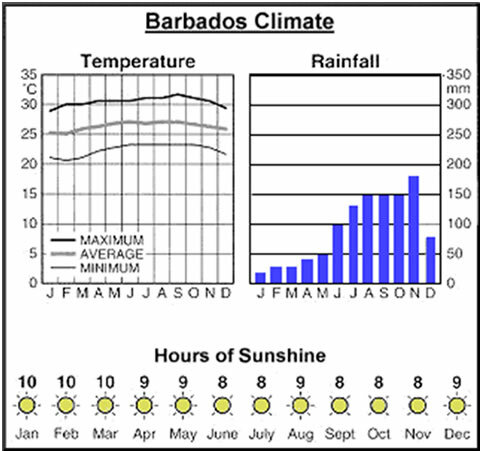 Barbados has an average of eight to 10 hours of sunshine per day from November to March and even in the wetest part of the year from April to October averages eight to nine hours of sun a day. It is generally warm and sunny all year round with an average daytime high of 75 – 85 F.
The nights are usually slightly cooler. The prevailing northeast tradewinds blow steadily so that although it is bright and sunny, it is not unbearably hot. The rain usually comes in quick showers. The dry season lasts from January to June. It rains most in summer and a good rainfall is refreshing and much needed. Rain is usually followed quickly by sunny skies and within minutes everything will be dry. Tropical rainstorms sometimes occur in the hurricane season which runs from June to October (as we say in Barbados – “June too soon, October all over!”). Tropical rains are spectacular but the island is very porous and the heaviest rains quickly drain off into the underground lakes or the sea. The official hurricane season runs from June 1 to Nov. 30, and August and September are the peak months. However, the Caribbean region is more vast than most people think, and the chances of any single island being hit directly by a hurricane are very slim. Hurricanes usually miss Barbados. Instead, the island experiences some spectacular tropical rainstorms. These are usually short and heavy spells that dry up quickly. Hurricanes usually avoid Barbados. They arise off the African Coast and head to the Caribbean, swinging North about 100 miles from Barbados. The pattern is reasonably consistent as hurricanes tend to bounce from one land mass to the next and Barbados is somewhat separate from the Caribbean island chain. This does not of course make us immune, but the last occasion which Barbados suffered a direct hit was in 1955. There is a story of a bus driver who drove his passengers straight through the worst of Barbados’ hurricanes, “was a bit of a breeze” he is supposed to have said. Other recorded hurricanes to hit the island occurred in 1898 and 1831. Most often, islands will only receive the heavy rains that come on the outskirts of a hurricane. Direct hits by major storms are so rare, in fact, that many elder inhabitants of Barbados still relate events in history to being before or after “the storm” because they may have only seen one or two of significance in their lifetimes. Additionally, with today’s meteorological technology, advanced warnings for hurricanes will reach you long before you are ever in danger, so keeping an eye on the weather before you leave will go a long way toward keeping you prepared. If you hear that a hurricane has hit before you are to arrive, all is not lost. You may not have to alter your trip at all, but do call ahead to verify current atmospheric conditions and extent of damage to the island; you may also seek a statement from local business owners as to whether they are conducting business or when they think they will be operational again. The table below contains selected climatological data for Barbados as reported from Grantley Adams International Airport in Bridgetown. Barbados is a fairly low-lying island with a central region that rises gently to rolling hills, and with a landmass only about two and a half times the size of Washington D.C., these numbers are a reliable gauge for weather conditions throughout the island.